Bathroom Specs A powder room is in the Main Pavilion, plus there is a full tiled bath with shower just off the pool deck. Main Pavilion's king suite also has a bathtub and a spacious dressing room. Pool Specs Heated pool with infinity edge, 18' x 25' x 4'-7' deep, with shaded alcove with seating, full bath + mini-fridge at pool area. Maid Service Frequency Hotel-type maid service seven days per week + evening turn-down service (personal laundry service is available at an additional cost). 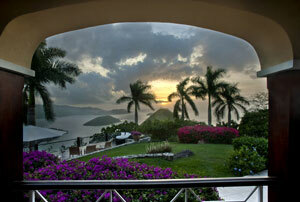 Square Footage Approximate interior: 5200 + exterior: 5500 = TOTAL: 10,700 sq. ft. 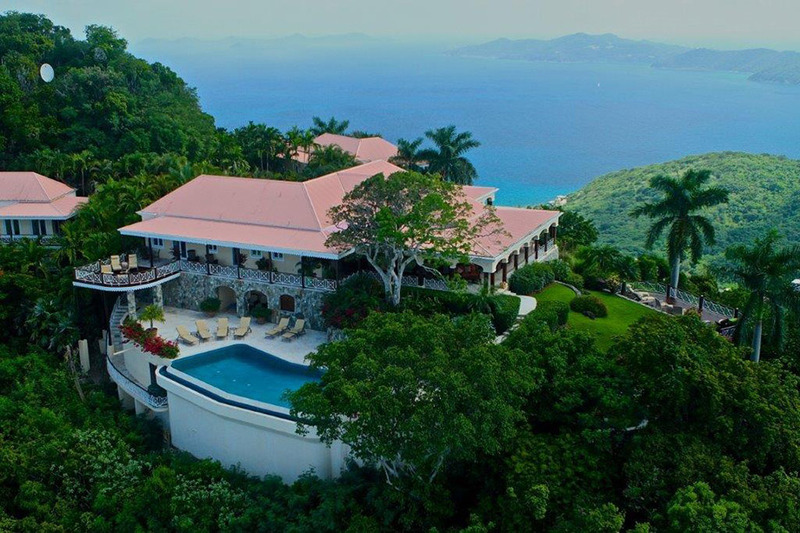 Surrounded within a lush oasis of stately Royal palms, this private 8-acre hilltop estate provides an amazing 300-degree bird's-eye view of the Virgins and miles and miles of azure sea and sky to the distant horizon. 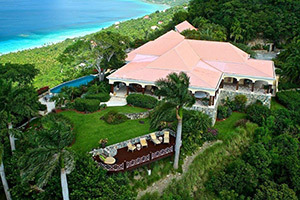 Exclusive St. Bernard's Hill House is the top of the world for those who seek privacy and a catered holiday in cool and breezy seclusion; your stay includes the talents of a gourmet chef for your dining pleasures. 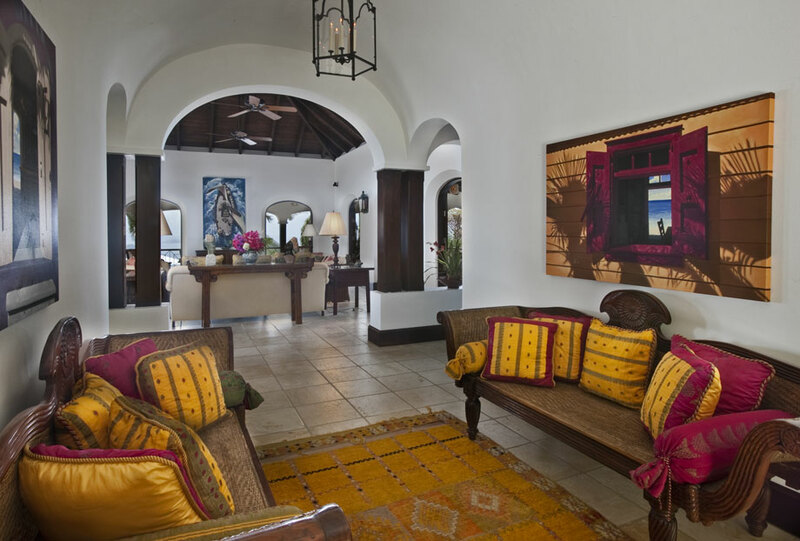 This five-bedroom property consists of four gingerbread-trimmed pavilions set within bowers of colorful bougainvillea, bird of paradise, tall Royal palms and sea almond trees. St. Bernard's spacious Main Pavilion comprises the richly-decorated Great Room, a dining room which seats 10, s spacious well-equipped kitchen, an air-conditioned study with a computer and a powder room. 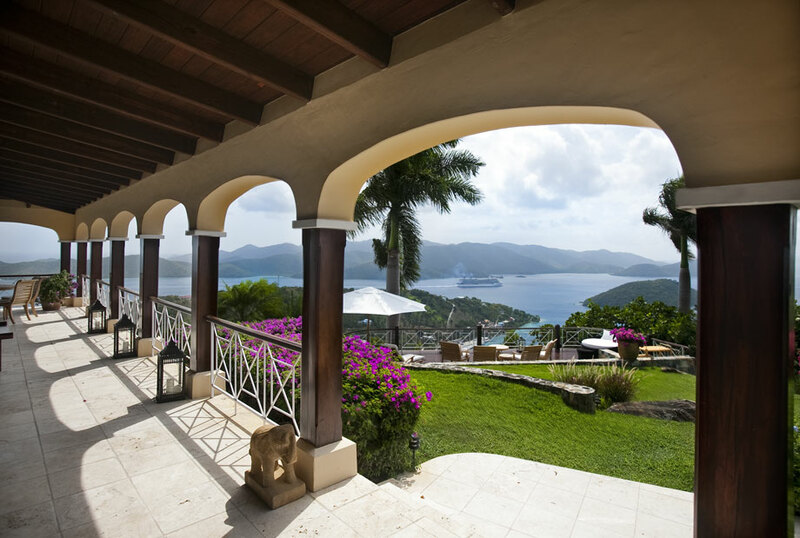 Arched doorways open out to a wonderful deep covered verandah which spans three sides of this Pavilion, overlooking the Caribbean and Atlantic's blue majesty dotted with green islands and cays. 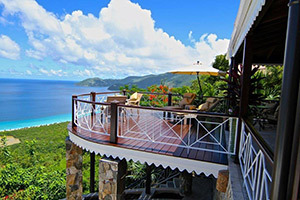 Various seating and alfresco dining areas are scattered around the wrap-around shady deck, ready for convivial gatherings, cocktails, or a game of chess or cards any time of day or night. On the lee side are a bar and cushioned seating for watching the big flat-screen satellite TV. 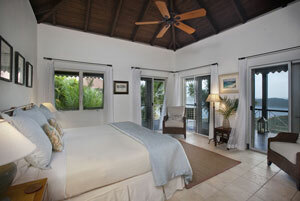 The Main Pavilion also houses a large king bedroom/bath suite. 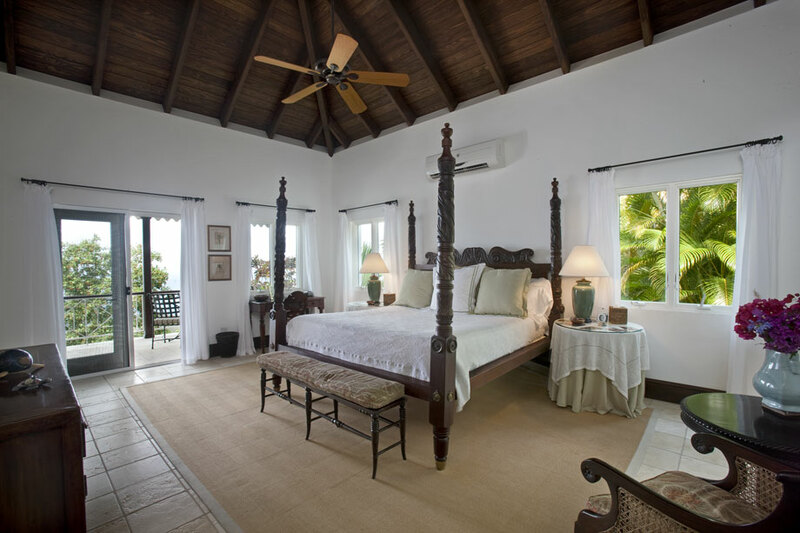 This sequestered master suite offers a carved mahogany four-poster bed and West Indian antique desk; screened french doors lead to a private verandah, a cool outdoor area with pool and sea views set with chaise lounges for two. 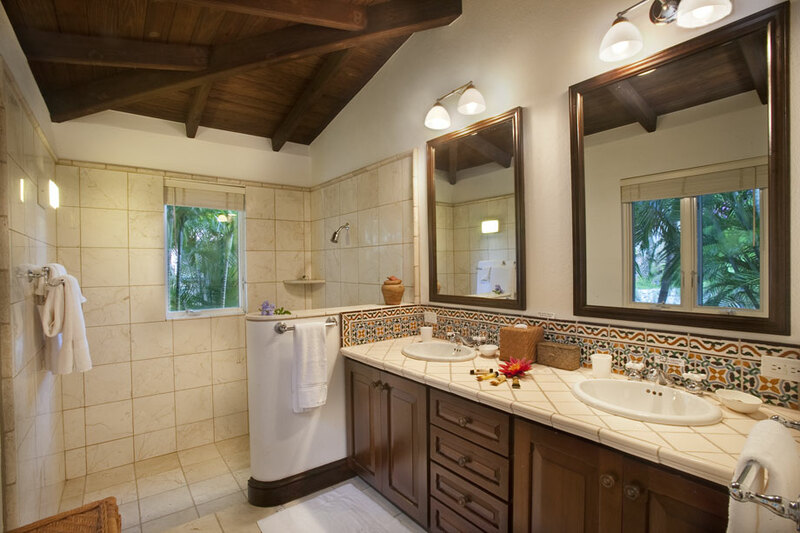 A hallway leads from the bedroom to its spacious ensuite master bath, featuring a double-sink vanity, a big tiled shower and bathtub, and a second hallway into the Main Pavilion. 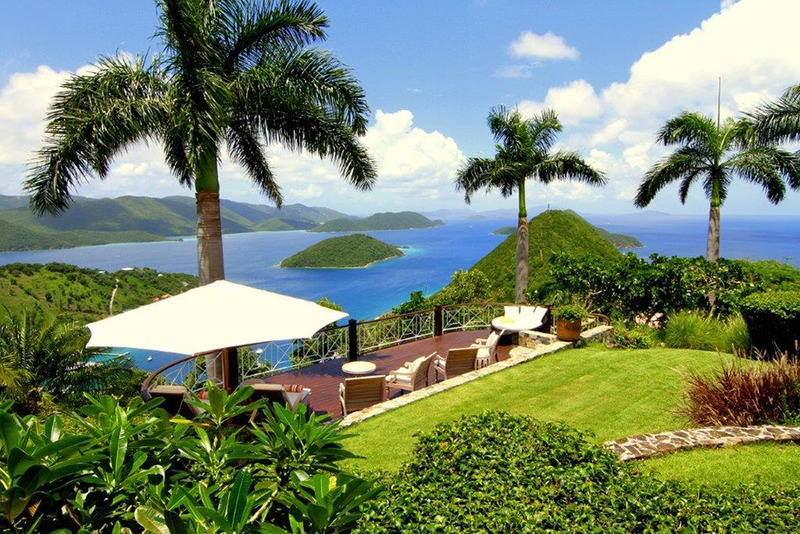 On the south side of the Main Pavilion is a manicured lawn which borders a wonderfully unique terrace overlooking the yachts coming and going below in Sopers Hole and a panoramic vista of islands and sea clear to the distant horizon. 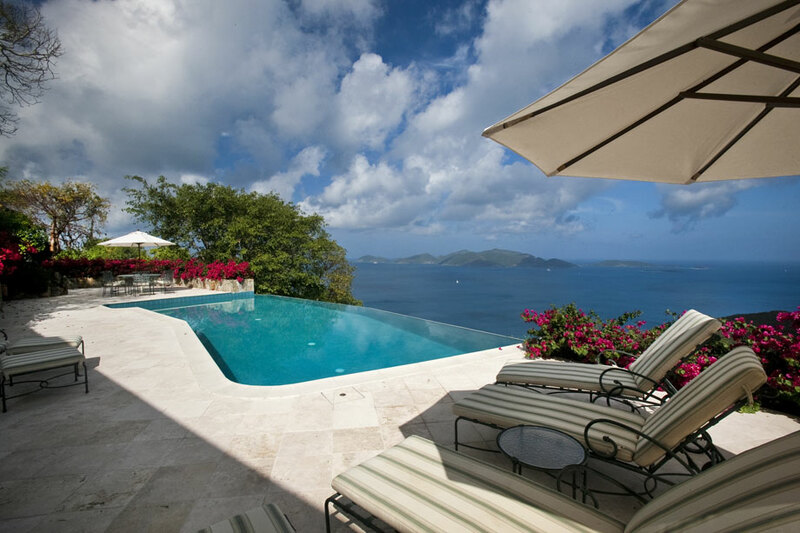 Dark polished imbuia wood, cushioned teak furniture and a canvas umbrella give this terrace a distinct luxury-yacht flavor. A few stairs from the lawn area descend through tropical plantings and past a private grassy nook with a hammock to the pool and tiled sun deck below, a totally-private haven dotted with chaise lounges and umbrellas. The superb infinity-edged pool is heated 24/7; the pool and deck overlook Tortola's Long Bay Beach, the sands of Smugglers Cove and the salt pond, where occasionally pink flamingos are spotted. 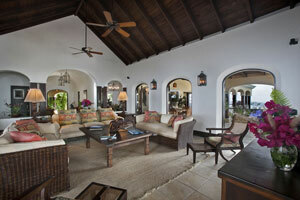 A shaded alcove sitting area is just off the deck, adjoined by a full bath and an outside shower. 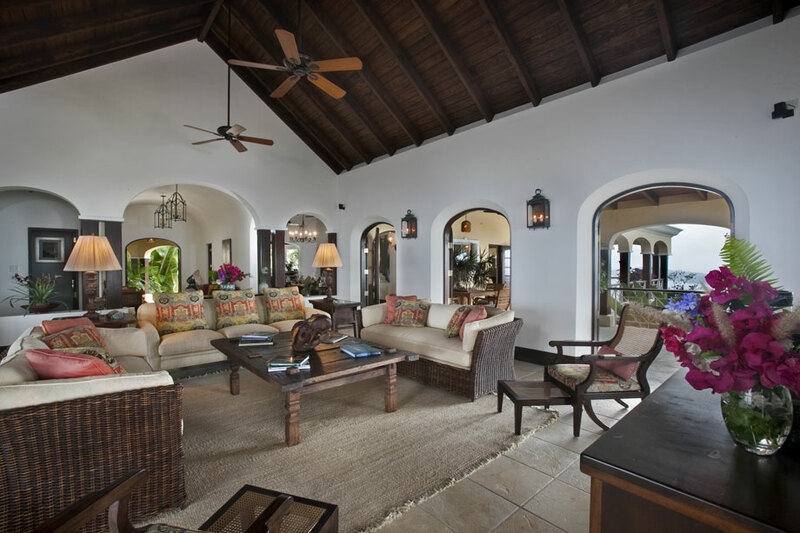 From the main entrance of the Main Pavilion, a walkway meanders through lovely gardens and tropical trees to the separate Oriental Cottage, tucked just far enough away from the Main Pavilion to provide romantic privacy. 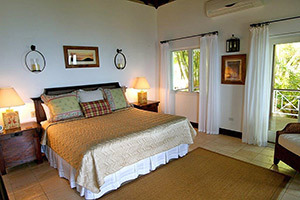 This air-conditioned Cottage features a king bed (which can be made up as two twins, with advance notice), a roomy covered hardwood verandah which wraps around two sides of the Cottage, a bath with large tiled shower, separate WC, TV and DVD player, iPod dock/CD player/radio, and a coffeemaker, microwave and mini-fridge for private breakfasts or snacks for just two. The Double Cottage is just adjacent to the Main Pavilion. This unique, two-bedroom, two-bath air-conditioned Cottage is just perfect for parents and small children. 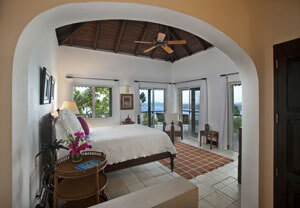 It offers the Contemporary and Caribbean suites, two bedroom/bath suites under one roof joined by an interior hallway. Both suites have a TV with DVD player and an iPod dock/CD player/radio. The Contemporary suite has a king bed and its own ensuite bath, and a cool, shaded L-shaped verandah via screened french doors. The adjoining Caribbean suite, with a king bed (which can be separated into two twin beds with your advance request), also has an ensuite tiled bath and a verandah overlooking the bustling marine activity below in Sopers Hole and St. John beyond. Both imbuia-wood verandahs are connected at the front of Double Cottage for easy access to both adjoining suites. Next door to Double Cottage is the charming Colonial Cottage, a separate air-conditioned bungalow with a four-poster queen bed, ensuite bath, TV and DVD player, iPod/CD player/radio, a coffeemaker, microwave and min-fridge for your early-morning convenience and privacy, and a wraparound verandah furnished with chairs and tables overlooking expanses of ocean and green islets and cays. 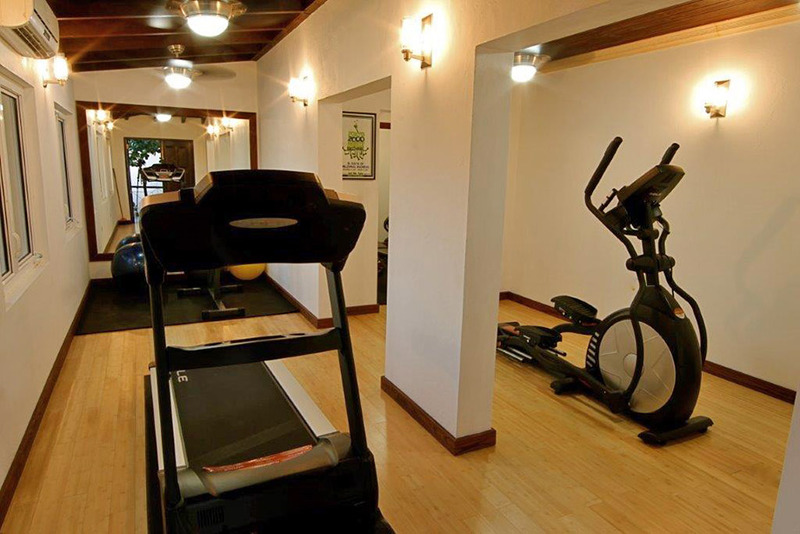 Below Double Cottage is the new air-conditioned home gym, well equipped with varied fitness gear, mirrors, a TV, DVD player, an iPod dock/CD player, and beautiful bamboo flooring. 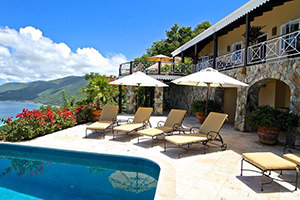 St. Bernard's Hill House offers serene seclusion in a very private, lush setting within an electronically-gated enclave. 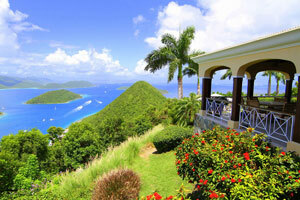 It boasts some of the most mesmerizing wide-angled views of ocean and islands to be seen anywhere. 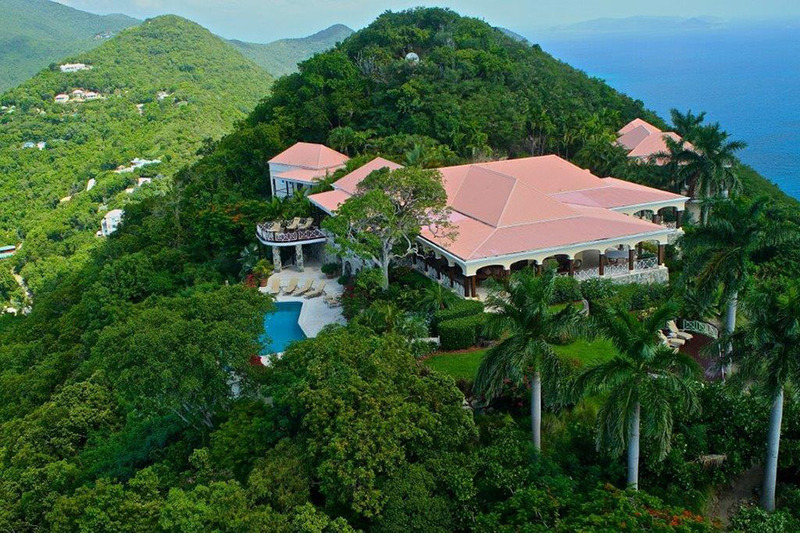 Its lofty hilltop location invites cool tradewinds wafting through the 8 acres of tropical landscaping and sweeping across the generous verandahs - this estate celebrates pampered outdoor island living in style. Eclectic and pleasing décor from around the world graces this unique property, with antique pieces, original Caribbean artwork, white gauzy curtains blowing in the breeze all adding to its charm and natural beauty - this is perfection from sunrise to sunset, and into the balmy island night with a sparkling canopy of stars overhead. All bedrooms are air-conditioned and screened, and are very well situated on the estate for maximum privacy for couples. 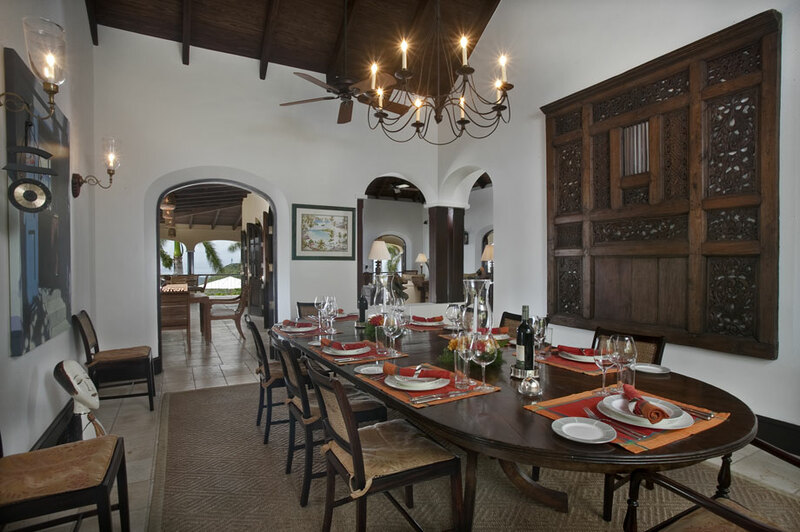 One of the estate's professional house chefs stands ready to prepare and serve a delightful selection of sumptuous meals for you. 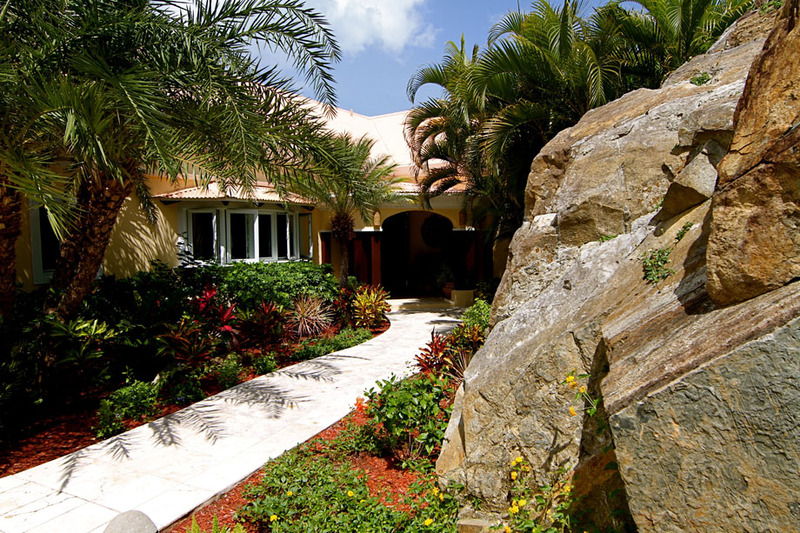 You'll be superbly cared for by St. Bernard's Hill House's gracious and attentive staff. 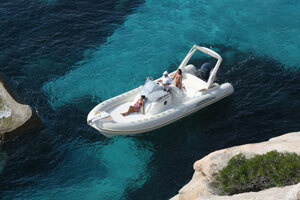 Five luxurious stars! 3 satellite TVs with DVD players + 4 TVs with DVD players (a 42-inch flat-screen satellite TV in covered outdoor bar/lounge area, a 40-inch flat-screen satellite TV in Main Pavilion's king bedroom suite, a 26-inch flat-screen TV in all four Cottage bedrooms, a 32-inch flat-screen satellite TV in the study, and a 32-inch flat-screen TV in the Exercise Room), Bose Surround Sound in Main Pavilion with indoor + outdoor speakers; books, games, movie + an iPod music collection; Wi-Fi throughout the property; air-conditioning and full screening in the study + in all bedroom suites; binoculars + telescope. IN STUDY IN THE MAIN PAVILION: Air-conditioning, 32-inch flat-screen satellite TV + DVD player, an LG PC computer with Skype long-distance, + a printer/copier/scanner. DINING ROOM: wine fridge + mini-fridge in sideboard. IN EACH BEDROOM SUITE: Air-conditioning, a 26-inch flat-screen TV with DVD player, an iPod dock/radio/CD player + alarm clock, hair dryer, monogrammed bathrobes + beach bags for guests' use, a mini-fridge and microwave, a safe for valuables + complimentary bathroom toiletries. EXERCISE ROOM: Air-conditioning, a 32-inch flat-screen TV + DVD player, iPod dock; Sole TT8 Treadmill, Sole E95 Elliptical Trainer (with heart monitors), Bowflex weight bench + assorted weights, Apex JD-3.1 Roman Chair by Impex, Weider Power Switch weight + dumbbell set (2.5-12.5 lb. barbells) with barbells, Perfect Pushup hand grips + 2 Weider exercise balls, + yoga mats. POOLSIDE: mini-fridge, covered sitting area + full bath; pool floats + foam noodles. ALSO AT ST. BERNARD'S HILL HOUSE: Gas BBQ grill, assorted snorkel gear, hammock, 2 mountain bikes, wooden baby crib, electronic gate at estate's entrance, automatic generator, dishwasher. There are two small, groomed dogs at the estate, which you may have restricted to the Manager's house if you prefer. PROFESSIONAL CHEF SERVICE for lunch and dinner is INCLUDED IN ST. BERNARD'S HILL HOUSE'S RENTAL RATES, AS WELL AS DAILY USE OF THE ESTATE'S CAPTAINED 30-FOOT POWERBOAT "BVI BEVERLEY" FOR 6 to 10 GUESTS (depending on the day's destination and the seas). 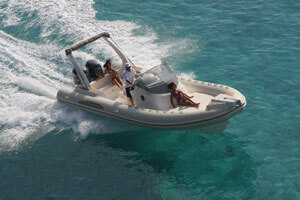 Guests only pay for the food and drink they order, plus fuel and any dockage fees when using "BVI Beverley." 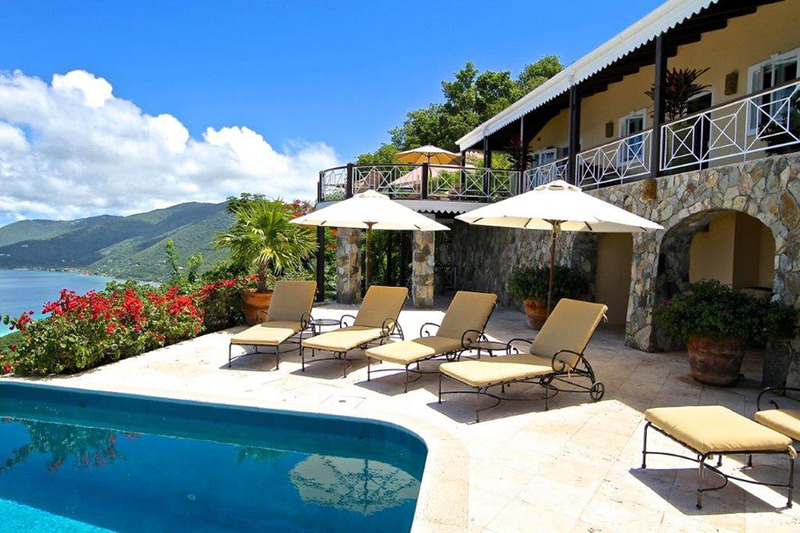 Chris, St. Bernard's Hill House's resident manager (a seasoned and personable boat captain), lives nearby on the estate, completely out of sight - Chris is just a phone call away should you need him. NOTE: premium fine wine vintages and champagnes can be ordered well in advance to your specification, at an additional cost. Special food / meal requests such as Kosher meats, daily lobster, or even fresh flown-in shellfish can be ordered in advance at an additional cost; please request further details). 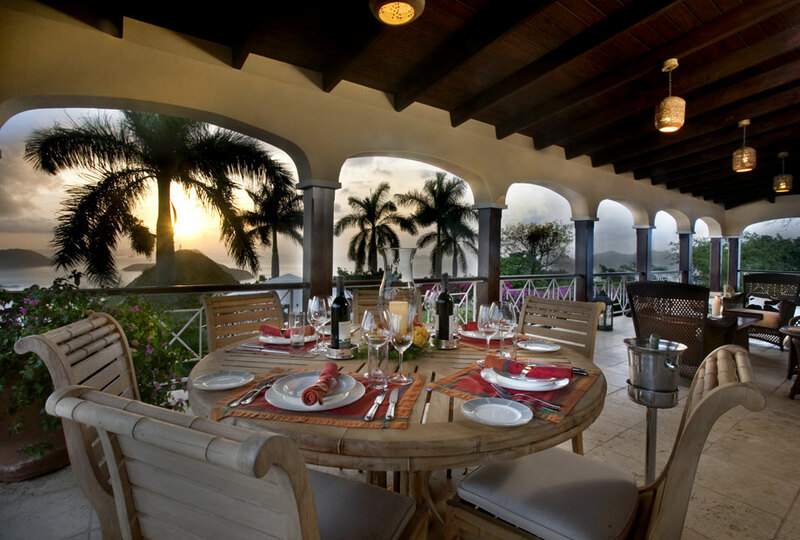 The chef will help you plan your meals and will present you with a menu catering to your tastes well before your arrival, so all of your meals will be prepared and served according to your desires. 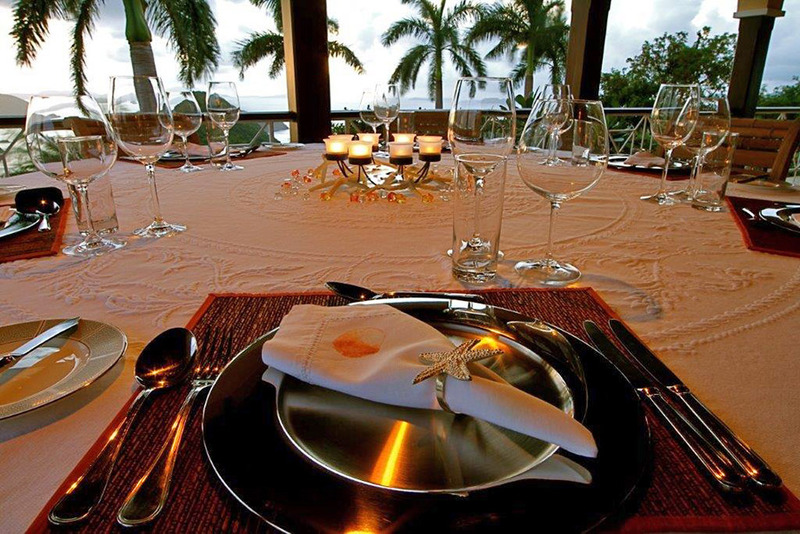 Dine on delectable dishes prepared fresh every day using local ingredients and herbs picked straight from our tropical gardens. Enjoy fine dining at its very best, complimented with freshly-baked breads, homemade pasta and homemade ice creams and sorbets. 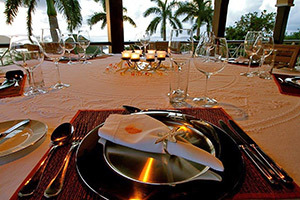 There are also two attentive stewardesses - you can look forward to inventive table settings, fine service and delightful cocktails - let them know if you have any favorites, or try something new concocted from our wide array of local tropical fruits! Meals will be served on a mutually-agreeable schedule. 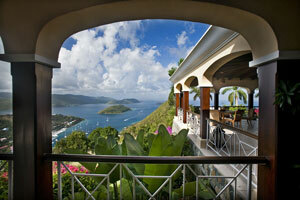 Download St. Bernard's Hill House sample menu here. YOUR RENTAL AT ST. BERNARD'S HILL HOUSE ALSO INCLUDES daily use of St. Bernard's Hill House's powerboat "BVI Beverley," a 30-foot luxury RIB tender with Captain Chris at the helm (you will be responsible only for "Beverley's" fuel and dockage fees). Captain Chris, an experienced sailor, guide and PADI Dive Master, will take 6 to 10 of you (depending on the seas that day) out to enjoy fabulous hours of snorkeling, watersports and sightseeing in these beautiful warm, clear waters, as part of your relaxing St. Bernard's Hill House total experience. Snorkel gear, water skis, a wakeboard, foam noodles and floats, a sun canopy and fridge are yours to enjoy while out boating. SCUBA gear may be arranged for qualified divers at an additional cost; if diving, no more than 4 guests on "BVI Beverley" is recommended (for more than 4 divers, Chris can arrange for the local dive company to take you on an underwater SCUBA tour (additional cost). Snacks, drinks and picnics can be arranged (included in the all-inclusive rental rates). 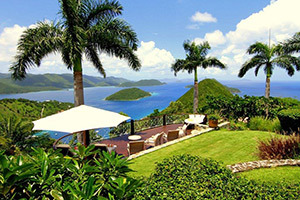 Boating is weather-permitting, and will be within the British Virgin Islands' islets and cays: take a trip to Jost Van Dyke to visit world-famous Foxy's, sip a refreshing Painkiller on the beach at Soggy Dollar Bar; have a picnic on Sandy Cay, visit Norman Island's infamous bar-boat, the William Thornton, and snorkel the Caves and the Indians. Stop at Peter Island's stunning beach for lunch at their excellent seaside restaurant, then head to Cooper Island for more snorkeling and beach time! Chris will share his wealth of knowledge with you. 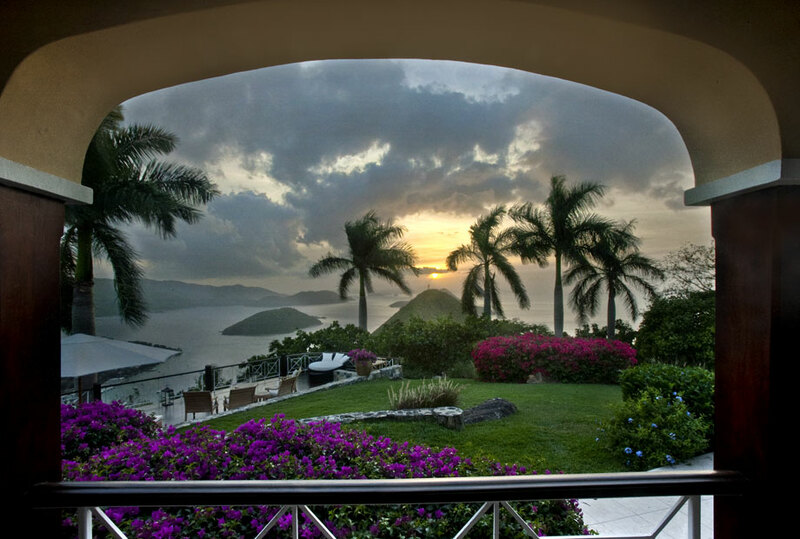 He has lived in the British Virgin Islands for over a decade, and will be happy to assist you with sightseeing, diving, snorkeling and secluded beaches. 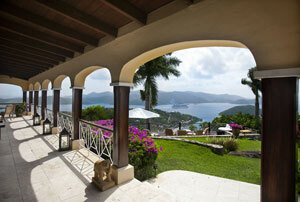 Your staff at St. Bernard's Hill House will offer you a personalized service that is second to none. 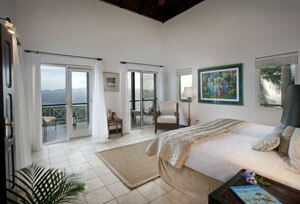 Your St. Bernard's Hill House's housekeeper takes great pride in the house and care of her guests. Every day she will ensure that your accommodation is kept beautifully clean and fresh at all times, so your room is always a haven of relaxation. Personal laundry service, washing and ironing, is available upon request at $25 per hour. The estate's gardener will be happy to take you on a tropical garden tour during your stay. Ask him about our local fruit and vegetables, and try some too! 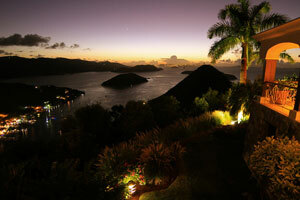 Keep a watch out for the different species of birds that make their homes in the grounds of St. Bernard's Hill House. St. Bernard Hill House accepts major credit cards - a 5 per cent surcharge will be added. 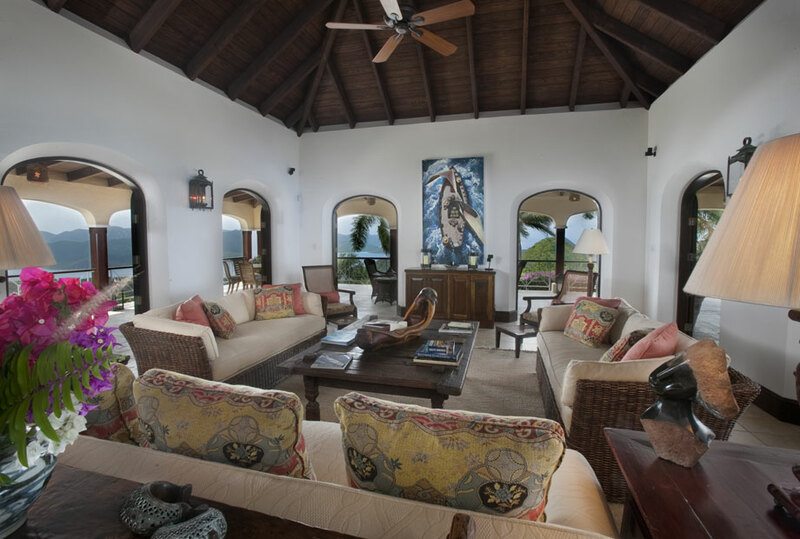 For a property as large as St. Bernard's Hill House, we must ensure adequate time between rentals to allow the staff to make the villa perfect. 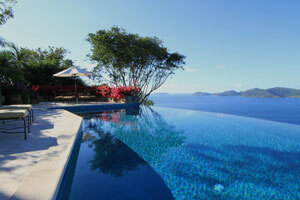 So, rentals where there are guests both departing and arriving on the same date cannot be considered. 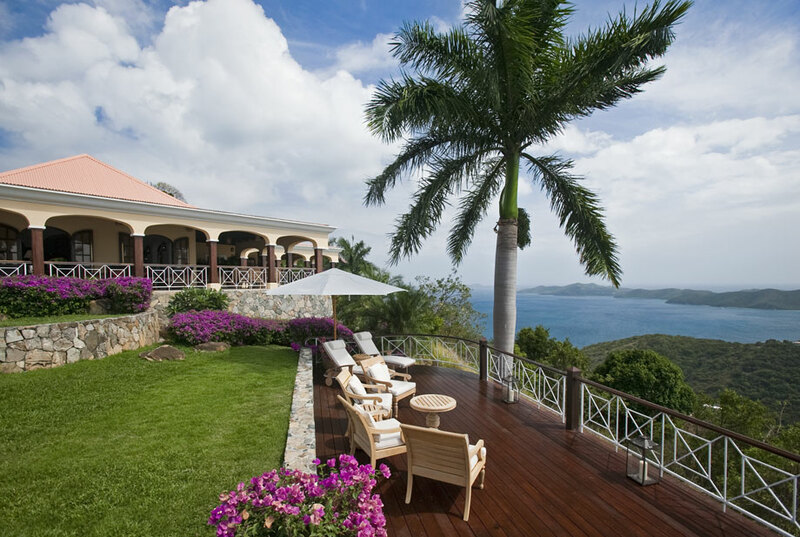 There are NO same-day turnarounds at St. Bernard's Hill House. 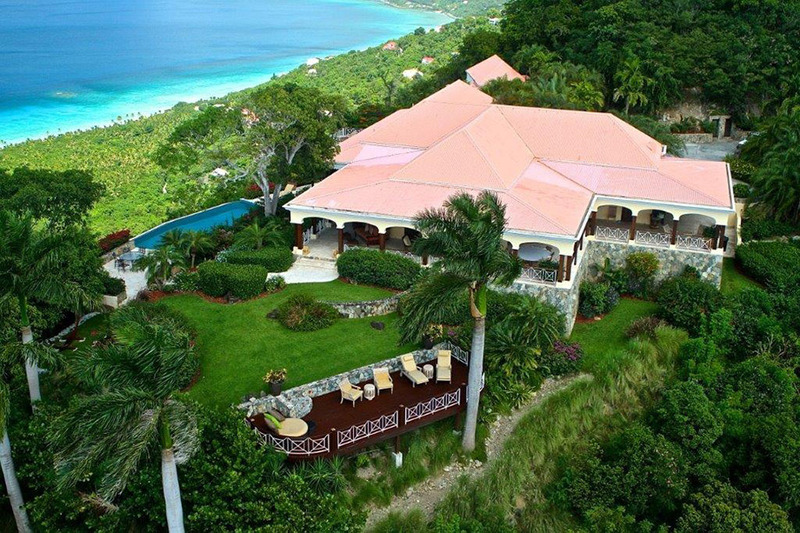 We recommend that you rent only 4WD vehicles for this hilltop estate. CHILD RESTRICTIONS: None - All children are welcome at St. Bernard's Hill House and a wooden baby crib is available for guests' use, with advance notice. MAID SERVICE FREQUENCY: Hotel-type maid service seven days per week + evening turn-down service (personal laundry service is available at an additional cost).